When Westinghouse and the developers Deane and Deane were trying to promote the Coastside they put out a little pamphlet which I will quote from later and they produced a calendar in an attempt to dispell the rumor that this part of the county was always foggy. The calendar featured a little yellow sun above the dates of the month when it wasn’t foggy. As I said before, when I first moved to Half Moon Bay, actually El Granada, “the banana belt” which is four miles north of the town, it was foggy all summer long, all three months until “Indian Summer” heated us up in September. 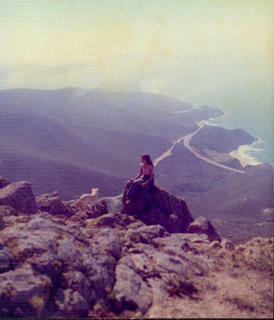 Folks I knew called El Granada, “El Gray” and when even the fog-hardened locals had had enough they drove “over the hill” to sun-drenched San Mateo. From Highway 92 you could look west and see the fog caressing Half Moon Bay. Hardly anybody wanted to go over there. Of course, when it was sunny the Coastside was (and is) the most beautiful place to be and so card-carrying locals felt they had to feed the rumor that it was more often foggy here than not. In fact, this is the first almost foggy summer I’ve experienced in quite a while. 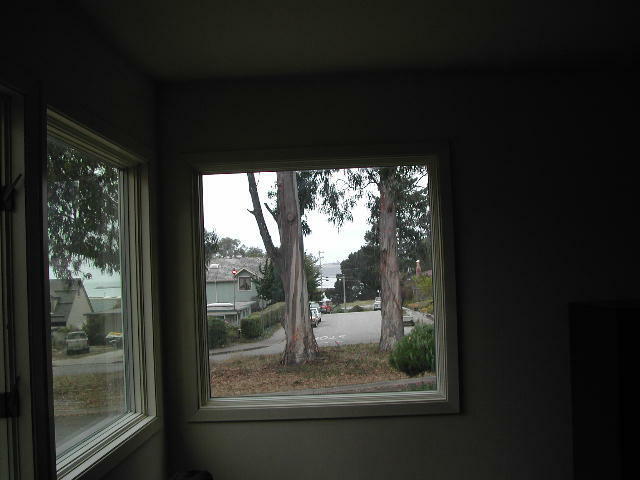 Through my window I can see a mass of Eucalyptus trees and bits of white sky in between the branches and leaves. It is so quiet and peaceful here. Soon after I moved here in the early 1970s, I became aware that Westinghouse was here, too. What was a big corporation doing in this rural scene? It was a time when some giant corporationss were buying up land for subdivisions. Westinghouse had teamed up with developers Deane & Deane and together they built the first upscale Coastside development called Frenchman’s Creek. I remember going to their opening and doing a walk-through a model house. From memory, the showplace house was airy and filled with hanging plants– which, because in my garden I had a little plastic geodesic dome where I tended ill plants–impressed me greatly. Westinghouse also had an interest in the ShoreBird Restaurant located in Princeton–and before the Shorebird John Patroni’s roadhouse, called Patroni’s, stood there. Patroni was “the man, the kingpin” during prohibition. His place was raided by the pro-his who sought his cooperation in nailing the leaders of the gangs who were bringing the booze in from Canada. In the late 1880s, in Half Moon Bay, the inventor R.I. Knapp was a teetoaler who ran for high office on the Prohibition Party ticket. Knapp also published a newspaper in town but was famous for the sidehill plow that he manufactured in a little factory on Main Street. He sold it to the farmers who found it helped them to work the soil on the hilly Coastside. After my “Half Moon Bay Memories” book was published in 1978 I met R.I. Knapp’s daughter who was well into her 90s and living in a senior facility in Millbrae. 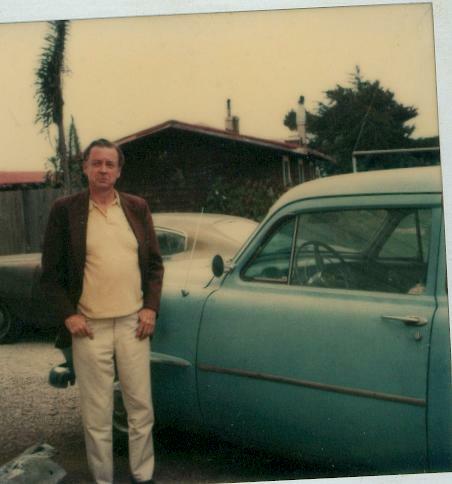 And here is R. Brandt, the well known Ocean Shore Railroad memorabilia collector/historian whose father had invested in the illfated company holding only worthless stock in the end (which bugged Brandt endlessly). 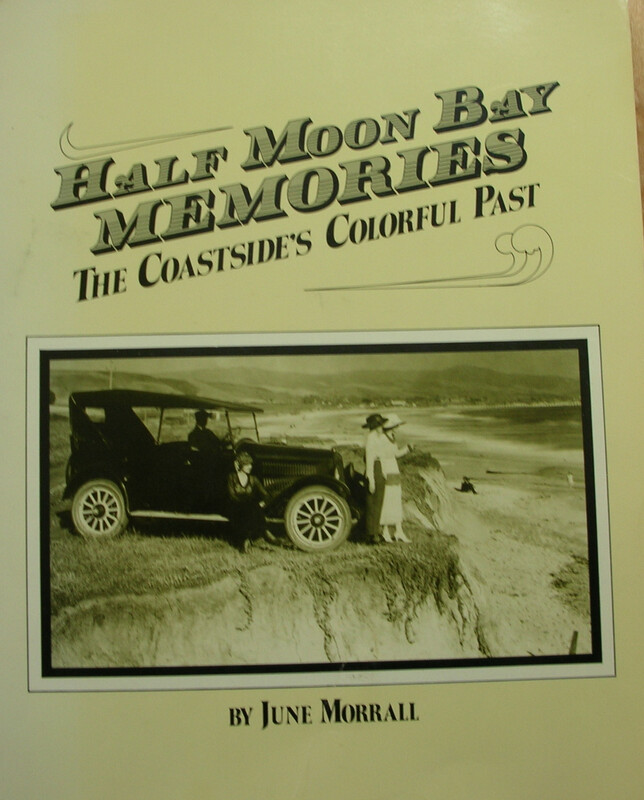 It was Mr. Brandt who gave me the cover photo for the “Half Moon Bay Memories” book. The photo is actually an automobile ad shot about 1922 at El Granada beach–I can see the spot from my living room window! 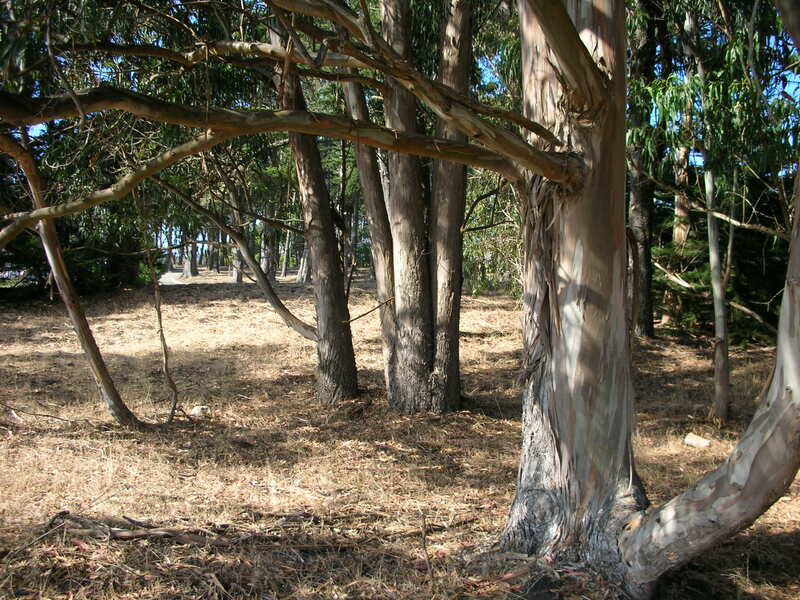 The corporation also bought land at the golf course south of Half Moon Bay. When I was in high school in San Francisco I worked for Westinghouse at Christmastime. My job was to go to the equivalent of stores like Target and show customers Westinghouse’s irons and other products. (But I was so shy I spent more time trying to blend into the aisles). I don’t think Westinghouse or Deane and Deane are involved with Coastside property anymore but they did leave us the legacy of the Pumpkin Festival. The Pumpkin Festival reminds me of the “free lunches” the promoters of the Ocean Shore Railroad gave to passengers in the early 1900s, an attempt to get new people here to sell them lots. The Pumpkin Festival is the same thing–people come here, they love it, they want to move here. Fog out there again, today. All day. Paul Schenkman, owner of the Cetrella Bistro on Main Street in Half Moon Bay, just called. He is going to remodel what once was the famous Ida’s Seafood Restaurant overlooking the harbor north of surfer’s beach. It’s going ot be a fresh fish market and restaurant called Sam’s Chowder House. 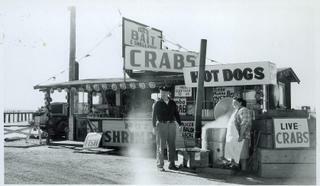 There are a couple of other restaurants there now and nearby stands the Beach Hotel. Great location for Paul’s latest. I loaned him a few historical photos, including a couple of Ida and her husband selling fresh fish from a colorful outside stand. Paul said he had the photos blown up and they look great. Can ‘t wait to see them. When I first moved here there was one old house north of Ida’s, a private residence with a driveway, with big old-fashioned glass windows overlooking the harbor,home to a lot fewer fishing vessels than today. And below on the sandy beach there were tiny shells to collect. A young couple lived there, and since it was one of the few homes overlooking the water on that particular stretch of coast, everybody wanted that house. I believe the house was sold, and didn’t I recently see a sign that it was for rent to someone who was in a fishing-beach-related business? First of all, it’s foggy….let’s celebrate….the last few summers have been all too sunny for me, this is more like it. In my opinion, when you live on the Coastside, it should at the very least be drizzly, gloomily foggy until the afternoon when the sun comes out for no more than three or four hours and then the fog returns. That’s beachy Coastside weather. I just don’t feel “right” if it’s not foggy during the summer. You want blue and yellow, go over the hill to San Mateo. You want hot, go to San Jose. I told you I’m writing this from memory–I do have notes among files and files of historical memories but after writing for newspapers for years and digging through my files over and over again I don’t wanna now. I just want to write from memory. It would be better to have my “facts” in front of me, make a better little story, so I am sorry about that. This morning I was thinking about a book I published in 1992 called “The Coburn Mystery”. It was a true story about the life of the doomed Coburn family who lived in Pescadero between about 1870 and 1919. The “Coburn Mystery” focussed on Loren Coburn, a rich but illiterate landowner (at one point he believed everything between Pigeon Point and the southern edge of Half Moon Bay was his) and all the terrible things that happened to him until he died in his 90s during the 1918 Influenza Epidemic. And after he died his wife was murdered– probably by one of the thuggish men who had moved into town and were trying to get everything Coburn owned without paying for it. The bad guys who drifted up from the Monterey area (and had some legitimate biz relationship with Mr.Coburn but now wanted to take advantage of him) had gotten so much control they were doling out jobs to the locals. The head thug who had a girlfriend from central casting–you know, blonde, liked pretty clothes and fast cars–had everybody terrified but was known to be kind during holidays like Christmas when he gave everyone in this rural village a present. What I was remembering, with humor, was one piece of research I did for that book. If you haven’t been Pescadero is located about 15 minutes south of Half Moon Bay on the San Mateo County Coastside but because there’s nothing to the south, just the redwoods to the east, and the Pacific to the west, it’s remained kind of frozen-in-time. Folks who lived there could keep secrets from the outside for decades. I became obsessed with the true story behind the “Coburn Mystery”. It was important to find locals who remembered anything, even though they would have been very young children. Turned out that Ron Duarte’s (of Duarte’s Tavern, gotta go there for artichoke omlettes and fruit pie) Aunt Carrie Dias did remember and so did Uncle Joe Duarte. Aunt Carrie lived in Pescadero and Uncle Joe lived near Santa Cruz. One day I picked them all up to take a trip to Los Gatos where a former Pescaderan lived. She was a lady who had been married to the chauffeur who drove the thugs around. It’s hard to imagine limos in Pescadero but Sarah, the murdered and extremely homely wife of Loren Coburn, got around in one. When I was at San Jose State it was a real treat to visit the Coastside. For one thing I’d be coming from a very hot place to a very cool one. I’d see the first signs of fog either at the top of Highway 92 (Skyline) or further west by Curly & Red’s automotive shop. Curly and Red were both alive when I first moved here, and, Curly had curly hair and Red had red hair. What else did you expect? Their shop was on Highway 92. Closeby were some greenhouses and the folks would dump the plants that didn’t make it near the road. When I discovered it I started going to the plant dump regularly rescuing borderline plants. I had a homemade dome shaped plastic greenhouse in the garden and that’s where I put my collection of ailing ferns and flowers. 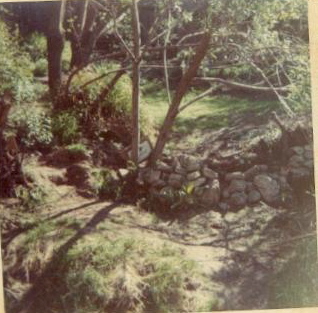 At San Jose State I lived in a big old house poised along the Guadalupe River–this was before the major freeway project began so it was pristine. Several of us at the house, with gardens dancing in our brains, decided to spread lawn seed and plant flowers along the bank of the creek. We wanted a special, private and beautiful place to visit. Main Street Half Moon Bay wasn’t anything like it is today. I’d have to say it was much more authentic in the 1970s, a place still truly cut off from the City and the Peninsula. The oldtimers were still around, the Portuguese wearing their hats sat on benches under the fog. Just outside of town on Highway 1 an elderly fellow sat on a chair watching the traffic, of which there wasn’t much. It’s hard to believe now, what with all the traffic and the sirens breaking the silence everyday, but when I first moved here there was none of the above. The road that led off Highway 1 to my house in El Granada was dirt. When I first saw that dirt road steps away from the Pacific Ocean I asked myself ‘how could this be?’ It was so rural and yet we were thirty minutes from the big City to the north (separated by Devil’s Slide, I shouldn’t forget to add). I should have known it was all on the edge of extinction. That a dirt road off Highwy 1 into El Granada couldn’t last for long. I took lots of walks from El Granada–crossing Highway 1 that was completely car-less to the beach–heading north along Surfer’s Beach, the beach at Princeton, the shore of which was littered with tiny shells, through the fishing village where a lot of folks lived in battered volkswagon buses and nobody bothered them. Half Moon Bay was the most idyllic place for a kid originally from San Francisco’s Sunset District. At the moment I’m at home on the Coastside enjoying the fog…(earlier today I had to drive on an errand to Mtn View and at 10 am it was broiling; I don’t like heat. I told you I grew up in the Sunset District where it was never sunny and I grew up to love and need fog. Actually I like all kinds of weather but I favor fog because its so emotional, kind of depressing. Most people, the vast, vast majority, love blue and yellow all the time, I like variety. The nice young clerk at Kibbles and Clips in Half Moon Bay told me when I said it had been sunny too long and I wanted fog, “Spoken like a true Coastsider”. She didn’t know how well I knew fog. I like it best when I can’t see the house across the street. I first started visiting the Coastside while going to San Jose State. I was also living in San Jose, even during the sweltering hot summers when most students headed for the cooler nights at Lake Tahoe. The new friends I made at San Jose State came from the Menlo Park-Atherton area and they knew and loved the redwoods of La Honda and the lonely, foggy Coastside beaches. That’s how I got to know both, through them. One good friend, John, my future ex-husband, worked at Memorial Park during the summer, cleaning bathrooms, etc. Occasionally we camped out at the park, walked the scented trails, listened to the trickling creeks and swam in the “swimming hole”. David Cline was the gorgeous lifeguard over several seasons, a contemporary of mine, who bought a quaint summer house off isolated Tunitas Creek Road, had some sort of business relationship with Neil Young and later became a very successful Coastside realtor. 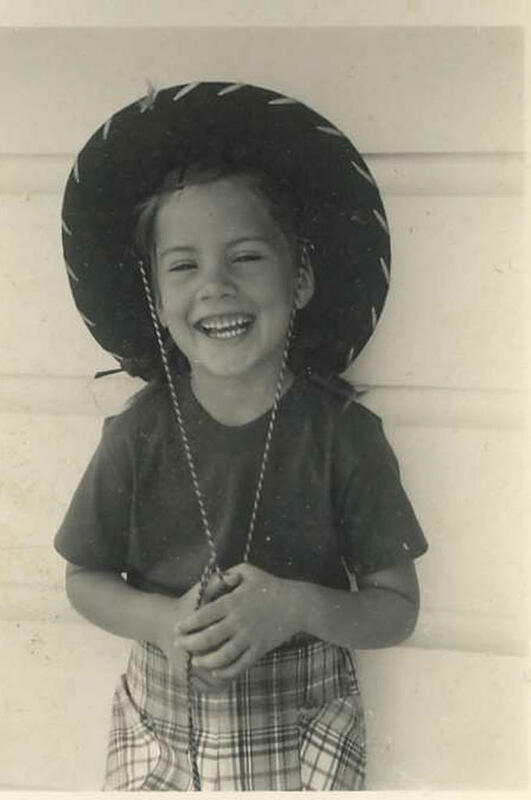 Around the time David was a lifegaurd or shortly thereafter– when the street outside our Coastside house was a pot-holed dirt road, not paved as it is today– a big bus pulled up in front. It was dark outside, there were no street lights then. I’m talking about a big bus, not the boss-man’s bus, but the kind that takes the rock star’s crew on tour. Tonight it was empty except for David who was at the wheel. He was laughing when the bus door opened with a “whoosh” and he stepped out. Looking back, it was a little moment but at the time it felt very big. Earlier I wrote that it was the old Coastside buildings, lucky to still be standing and dying to talk, that got my attention. The first one that tested my curiosity was the Miramar Beach Inn and that was because it was getting a new look. The âMiramarâ? was a very funky place when I first saw it. A dark but cozy bar with Joe the bartender who sang opera while he poured bountiful pitchers of beer. Very picturesque. But soon a young guy with money and very high energy bought the place and moved upstairs with his cute blonde wife. Up there they enjoyed a fantastic view of the Pacific. And there were other little rooms on the same floor. These were rented out to people who worked in the restaurant. It wasnât long before I learned the Miramar had once been home to a red-haired madam called Maymie (a local hairdresser, the second wife of a county supervisor, told me she dyed the madamâs hair red). Maymie lived upstairs and the hookers she hired were girls just passing through looking for a little work. 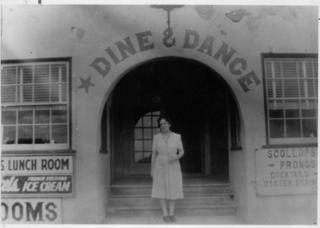 Maymie was a long time resident, living at the Miramar between about 1918 and 1955. Downstairs was where the party wasâ in the restaurant and bar. And if someone wanted to take the party upstairs there was a dumb waiter that could be activated from the rooms, bringing drinks and food. The Miramarâs heyday was in the 1920s during Prohibition and its location overlooking the Pacific was perfect. Just imagine Maymie could look out the window and see the rumrunners sailing in fishing boats and the like withillegal liquor, booze that was unloaded along the secluded beaches, probably right in front of the Miramar and certainly to the north at Princeton Harbor where there were several piers. 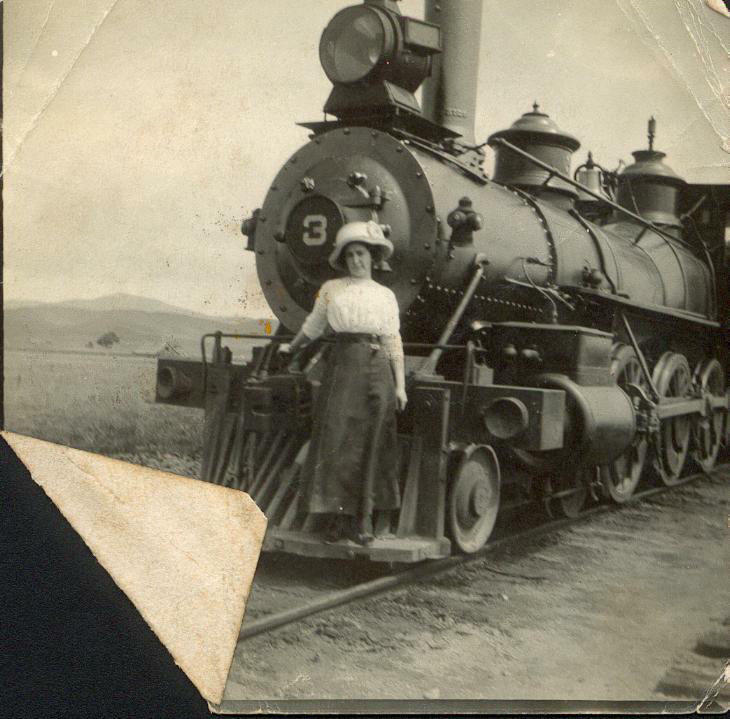 Maymie, herself, was probably working with the bootleggers and rumrunners. But when poring over old newspapers there is evidence that Maymieâs Miramar was busted by prohibition agents. They probably didnât recover every illegal bottle of booze though, because the resourceful madam ordered her contractor to design revolving cabinets and movable floorboards to confound the authorities. I never visited the Coastside while I was growing up in San Francisco. I didn’t even know it was there. What I tell people is that one of the things I learned in school was to move to Marin County. Even now it seems as if all my classmates at Lincoln High School live somewhere on the north side of the Golden Gate Bridge. Sausalito was a big attraction; there wasn’t much else over there then. I took swimming lessons in Terra Linda and rode on the Greyhound bus there over a little dusty highway. The driver actually stopped on the highway and I walked across the road and the mile or so to the swimming school. During the summer my parents took regular outings to Searsville Lake, a wonderful place for a kid to swim. There were small floating rafts to hang onto and a big one that held a dozen swimmers or so. My dad would drive south from San Francisco along bucolic Canada Road and we’d make the mandatory stop at the Pulgas water temple. We’d get out of the car and I’d run over to the “water temple” and stare down to watch the water flush like in a big giant toilet, or that’s what the kid-part of me remembers. Later I heard the temple had been dedicated (was it in the 1930s?) to an artist called George Sterling, a poet whose least favorite drink was water. To get to Searsville Lake you had to drive through a dark, woodsy part of Woodside. For some reason my father always got stumped there and we took a few wrong turns before we entered a clearing that led to the lake’s parking area. The weather was always roasting hot, there were bees, picnic tables and small boats to rent. We never went to Half Moon Bay. I’m sure if I looked to the west I would have seen a thick cover of fog. One HMB oldtimer who was born in the 1880s told me she couldn’t remember when the Coastside wasn’t foggy. Having grown up in San Francisco’s Sunset District–which was anything but sunny–I was accustomed to the fog, and you know what? I liked it.